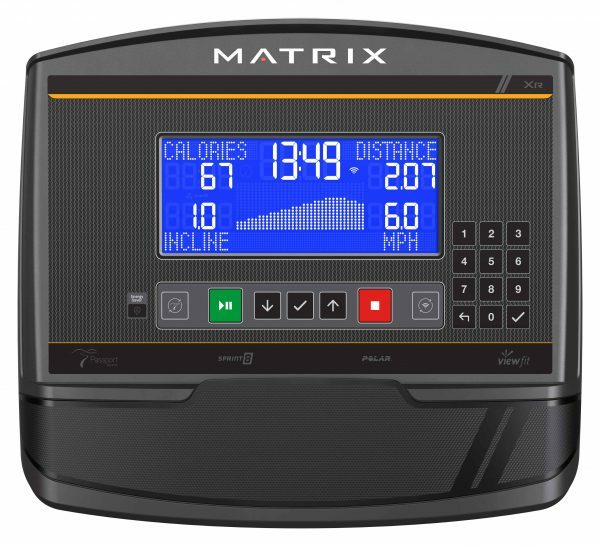 View cart “Matrix TF30 XR Treadmill” has been added to your cart. 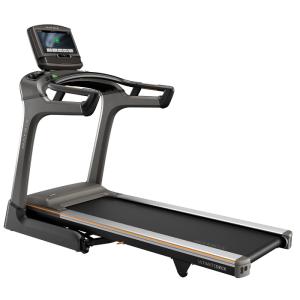 With the Matrix T70 Xr Treadmill you will experience a natural, powerful run with the industry’s most advanced frame and deck combination. 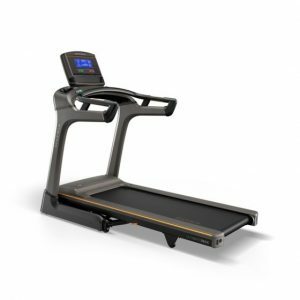 The Matrix T70 XR Treadmill includes a heavy duty welded steel frame for unmatched stability, a durable AC motor, our exclusive Ultimate Deck System, a waxed belt and an extra-wide running surface. Display: 8.5″ Extra-wide blue LCD (22 cm). WiFi Enabled: Software updates, ViewFit Connectivity. USB Port: Internal USB port for software updates. Heart Rate: Wireless heart rate, Polar compatible. Console Extras: Integrated reading rack, energy saver mode. Workout Programs: 5 Total — Manual, Intervals, Rolling Hills, Target HR, Sprint 8. Workout Feedback: Time Elapsed, Time Remaining, Miles/ Kilometers, Current Speed, Pace, Heart Rate, Calories, Incline. 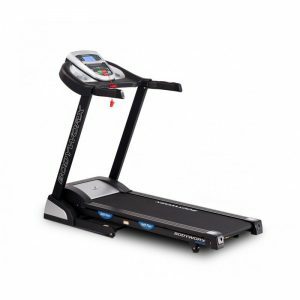 Running Area: 56 x 152 cm / 22″ x 60″. Running Belt: 2-ply waxed, 2.2 mm. Deck Thickness: 25.4 mm / 1″. Drive Motor: 3.0 HP continuous-duty AC drive system..
Incline Range: 0% – 15%..
Extras: Water bottle pockets, device rack, soft-touch buttons, heart rate grips, aluminum side rails. Assembled Dimensions: (L x W x H) 201 x 91 x 156 cm / 79″ x 36″ x 61″. Assembled Weight: 138 kg / 304 lbs. Max User Weight: 181 kg / 400 lbs. A 56 x 152 cm / 22″ x 60″ running surface as wide as what you would find in your favorite fitness center gives you the room you need for hard runs and near threshold sprinting, perfect for high-intensity interval training. Includes water bottle pockets, soft-touch buttons, heart rate grips and aluminum side rails for a comfortable, convenient exercise experience. The exclusive Ultimate Deck™ System includes a heavy duty frame, extra thick deck and industrial grade cushions for miles of durable performance. The industrial grade 3.0 HP continuous duty AC motor provides efficient, durable, responsive performance with minimal internal components require little maintenance, and an absence of internal friction keeps the motor cool and quiet. 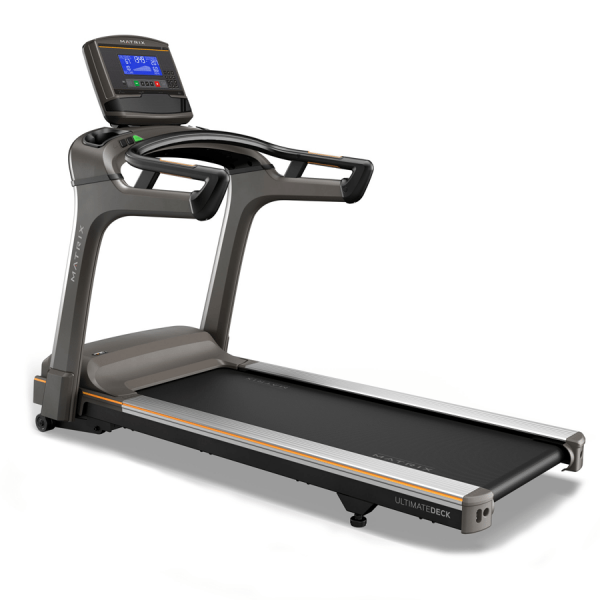 The Matrix T70 XR Treadmill belt is designed with a proprietary wax application process that automatically lubricates as you run, eliminating the need for routine silicone lubrication.